On offer from us is a highly acclaimed range of 3m Very High Bombardment (VHB) Tapes. These tapes are used for holding static and dynamic loads in place by a wide array of industries. Their visco-elastic properties allow them to absorb shocks and distribute the stress evenly for bonding applications. Also, having a strong bond of acrylic adhesive, these tapes are a highly effective and easy to use substitute for the mechanical fasteners and welding. Backed by 5 years of rich industry experience, we have established ourselves as the distinguished manufacturer, supplier & importer of a wide range of Industrial Tapes and Abrasives. 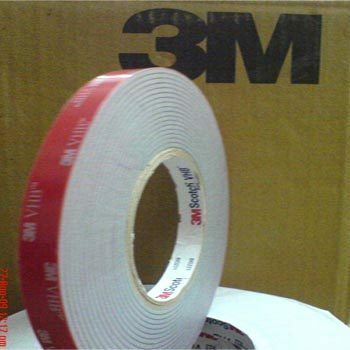 The various products in this range are 3m Mirror Mounting Tapes, 3m Very High Bombardment (VHB) Tapes, Abro Masking Tapes, Backup Rods and Fiberglass Tapes. We are also engaged in offering Curtain Wall Tapes, Structural Glazing Tapes, Floor Marking Tapes, Aluminium Foil Tapes, Anti Skid Tapes and 3m Green Corps Grinding Discs. We manufacture these products using quality raw material and employ advanced technology, for absolute quality assurance. The raw material we use is sourced from highly credible merchandisers, having unblemished track record. Our highly advanced facilities are in sync with the latest advancements in the related field and assist us in offering superior quality products. Furthermore, in addition to the wide range of standard specifications, we also provide customized products as per the client demands. Also, we make sure that these products undergo strict quality control at all levels of production starting from raw material procurement till the final dispatch of the products. We hold the requisite capabilities to effectively pack our products for absolute safety and deliver them by road, sea or air routes to the major markets across the country and in East Asia. We accept various payment terms like cash, D/A, cheque and D/P.